Nangklao (Rama III), or King Jessadabodindra (full royal name Prabath Somdej Pra Paramadhiwarasetha Maha Jessadabodindra Siammintarawirodom Borommadhammikkarajadhirat Boromanathbopitra Phra Nangklao Chaoyuhua) (March 31, 1788 - April 2, 1851) third of the Chakri dynasty, was king of Siam from 1824 to 1851. He was selected as successor by an Ascension Council because his younger brother, later Rama IV, was considered less suitable, although born to a senior Queen. The future Rama IV took monastic vows as a Buddhist monk to avoid possible assassination. Rama III was the last traditional monarch of Siam. Though his successors were also traditionalists, they started to modernize the kingdom. Rama III was king over the largest territory ever to be subject to Thai rule. He entered a trade-treaty with Britain in 1826. His father had received two diplomatic missions from Singapore but no treaty had resulted. Rama III realized that unless he made some concessions to the British, who had now entered Burma, they might simply take by force what they failed to gain by peaceful means. He actually gave limited trade concessions, but this was sufficient to cement a special relationship with the British that opened up Thailand to trade while yielding none of her independence. Thai remained the only nation in Indochina that did not fall to one of the colonial powers. Instead, by negotiating with the British to the West and the French to the East, the Thai kings secured recognition as a neutral buffer zone. King Nangklao was born during the reign of King Buddha Yodfa Chulalok, later known as Rama I. As the oldest grandson, he was named Tub ("live"). He was the oldest son of Prince Issarasundhorn (later King Buddha Loetla Nabhalai, or Rama II) and Chao Chom Manda Riam (later KromSomdej Phra Srisulalai). Prince Tub joined the army when his father and grandfather went to war with Burma. While in the military, he was trained to succeed as king. A week after his father became King Prince Kasutranuchit, the only surviving son of the former King Taksin, who had been deposed in 1782, revolted. Prince Tub led the Royal Police against Prince Kasutranuchit. After Prince Kasutranuchit was executed, Prince Tub became known as Krommhean Jessadabodindra. When Prince Jessadabodindra was 37, King Rama II became seriously ill and died, without having named his successor. According to law of succession, Prince Mongkut (later King Rama IV) should have become king because he was born from the queen consort of King Rama II. However, the older Prince Jessadabodindra was seen as a more appropriate choice, having headed such administrations as the Department of Royal Household, the Treasury, Department of Foreign Affairs, and the Supreme Judicature. After an assembly, the house of nobility approved Prince Jessadabodindra as the 3rd King of Bangkok. Mongkut, passed over for the throne, took monastic vows. Some sources suggest that Mongkut thought his life in danger and so chose to retreat from politics. 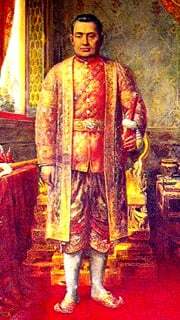 King Rama I, founder of the Chakri dynasty, as the first king of the Bangkok period in Thailand's history, became known straight-forwardly as "the first king." His successor, King Rama II became known as "the middle king." In this naming system, Rama III would have been called "the last king," which was considered a bad omen and so was not used. Instead, Rama III renamed his predecessors Buddha Yodfa Chulalok and Buddha Loetla Nabhalai. 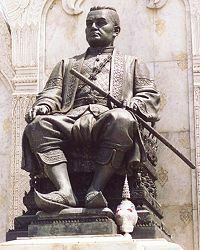 His successor, Mongkut gave him the name Nangklao. During the 27-year reign of King Nangklao, trade between Siam and China became very prosperous. His royal merchants constantly set sail for China, and became very profitable. Reputedly, Rama III kept his profits in red bags beside his bed, so his money became known as Red Bag Money. King Rama regarded the Red Bag Money as surety to buy land back if it were to fall to a foreign power. During Rama III's reign, Siam became a military power. It repulsed Vietnamese invasions. He also made inroads into Cambodia—and the country was partitioned between Vietnam and Siam. Rama III also overran Laos and ordered the destruction of Vientiane in 1827-1828. In 1826, he negotiated a trade-treaty with the British, known as the Burney Treaty (named after Henry Burney, the British negotiator). This treaty gave lumbering and mining concessions to Britain, in return for recognition of Thai independence. It also established commercial links between Singapore and the community of Chinese merchants in Bangkok. The British, however, wanted more trading concessions, and pressured Rama III to grant these. He managed to resist, refusing to extend the provisions of the Burney Treaty when Sir James Brooke, the Rajah of Sarawak in Borneo (known as the "white rajah"), arrived in 1850, to press for a new treaty. Rama was ill at the time, and so did not negotiate in person. In 1850, when a United States envoy, Joseph Balestier came to enter trade talks, he was received by the Finance Minister. After a 26 year reign, King Nangklao was succeeded by his brother Prince Mongkut. Possibly aware of Mongkut's strong claim to the throne, Rama III chose not to name a successor, thus leaving it clear for his brother's succession. ↑ Simply Thai.com, King Nangklao—Rama III—King Mongkut—Rama IV. Retrieved October 10, 2007. ↑ The Siamese Collection, Kings of the Chakri Dynasty. Retrieved October 8, 2007. ↑ Thailand, and Rama. Proclamation against Opium, 18 May 1839. Bangkok: D.B. Bradley at the ABCFM Press, 1839. Vella, Walter F. Siam Under Rama III, 1824-1851. Locust Valley, NY: Published for the Association for Asian Studies by J.J. Augustin, 1957.